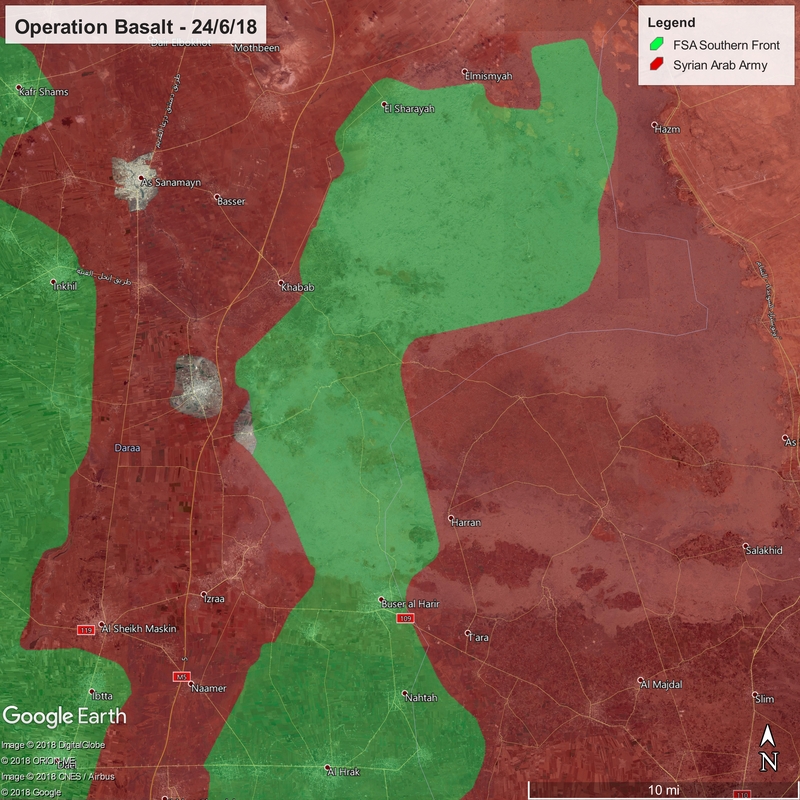 After capturing the crucial town of Busra al-Harir in a pre-dawn assault, the Syrian Arab Army continued its assault to the south. Army troops seized the village of Maliha al-Tash and the town of Nahtah. So far there has been no rebel counterattack. This advance puts the Army in a position to mount an assault on a chain of towns centered around the rebel stronghold and key government target of al-Hirak. In the above slideshow, a satellite image from June 22 is compared to one from June 25. Constrating the images, destroyed buildings can be see, indicated by red circles. These buildings were destroyed by Russian and Syrian airstrikes, because the buildings were suspected of housing rebel fighters. UPDATE: The Syrian Army has captured the town of Busra al-Harir since the writing of this article. In a night assault, the Tiger Forces sent in tanks and technicals (machine gun-armed pickup trucks) into the town, reportedly encountering little resistance. Dawn broke without the rebels launching a counterattack. The Syrian Arab Army continued the assault it launched yesterday on rebels in eastern Daraa province. Syrian Army soldiers continued to advance in the al-Lajat plateau, seizing five more villages from Free Syrian Army forces. The rebel salient is rapidly collapsing, and at the current rate of advance will be captured within 48 hours. Hello and welcome to the 466th installment of the SWD. Today the Syrian Arab Army launched a widespread assault on Free Syrian Army rebels in the eastern part of Daraa province. 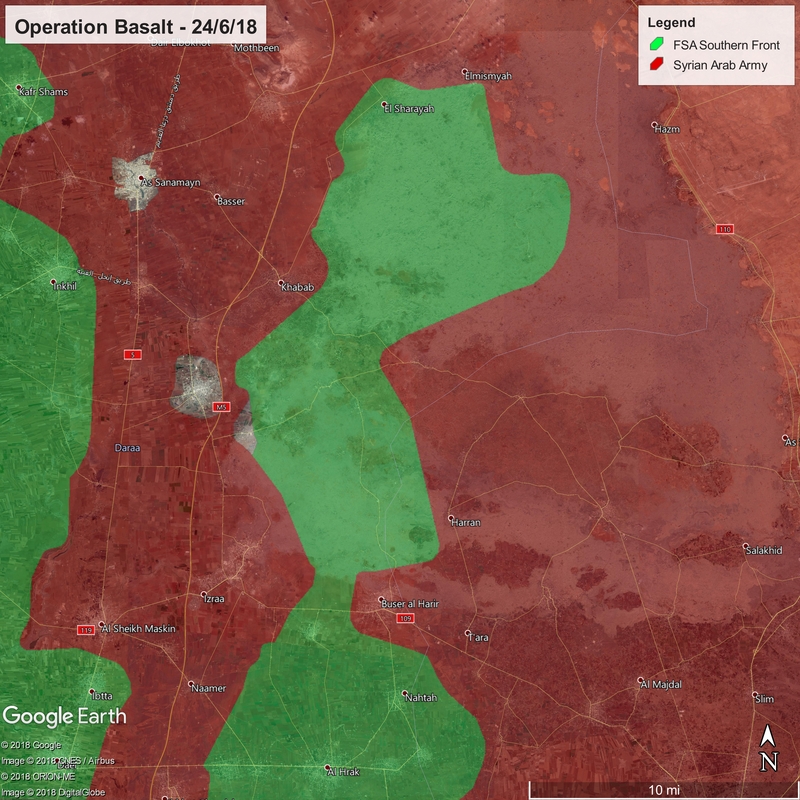 Syrian Army tanks and soldiers shored up their positions on the eastern edge of the al-Lajat region, breaking into the plateau and seizing five towns from Free Syrian Army forces. Hello and welcome to the 465th installment of the SWD. Hello and welcome to the 464th installment of the SWD. Hello and welcome to the 463rd installment of the SWD. Hello and welcome to the 462nd installment of the SWD. Hello and welcome to the 461st installment of the SWD.